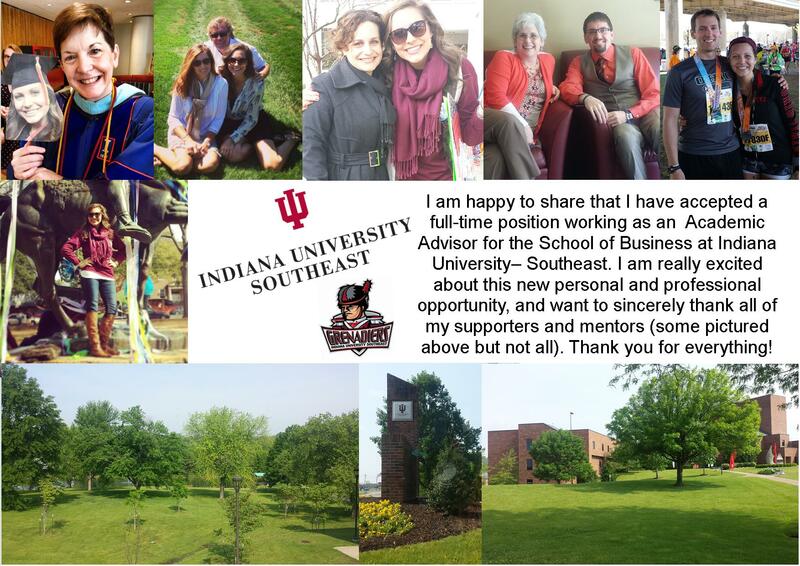 I am extremely excited to share with you that I have officially accepted a full-time position as an Academic Advisor for the School of Business at Indiana University- Southeast. I have gone through some significant positive changes in the past two years of my life, and have met the most amazing and compassionate people. I would be remise to say that I won’t miss my colleagues at the University of Louisville and the University of South Carolina, but I know those friendships will continue to grow. I am grateful to all my supporters and mentors, and couldn’t be more appreciative of those that continually believe in me and have patience with me. Thank you. As I reflect on all that has happened over the past two years, I am so humbled by God’s love and ability to intentionally bring people and opportunities into your life. You are foolish in thinking for even a moment that you have any control on the outcome of your life. God has already predestined you to encounter the things you’ve encountered, struggle with the things you’ve struggled with, and meet the people and opportunities that have molded you into the person you are today. My faith in God and His unconditional love and grace has been the one constant and strength in my life. He is a merciful and powerful God. In closing, I just want to thank all my family, friends, colleagues, and mentors for your support, encouragement, and patience. I am excited about this new personal and professional opportunity, and can’t wait for the new relationships, mentorships, and life lessons to be had. We’ll go forth to love and praise thee!